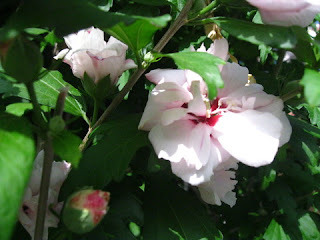 Today is my mom’s birthday, so I’m going to write about how to take care of one of her favorite plants, Rose of Sharon. My mom can take a cutting from a family member or neighbor’s plant, stick it in the ground in her Long Island, NY backyard and voila’ she has a new plant. They just LOVE her! Maybe they love her more than she loves them, I’m not really sure. Hybiscus syriacus is a deciduous shrub, which means it loses it’s leaves in the fall, also these plants actually produce leaves quite late in the spring, so enjoy its beautiful branching structure and use it as a backdrop for winter and spring blooming perennials. The flowers can be single, semi-double, or double and come in a range from white, to pink, to lavender, to blue, some even have an “eye” of a different color, and they are edible! This is a great plant for full sun to partial shade; you can use it in a border, as a hedge, an accent, or in a container. Some people won’t want to use it as an accent because it is deciduous, but if you use the tip above you might learn to enjoy your garden in a different manner. 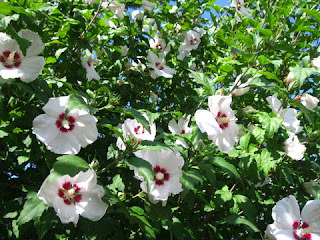 The Rose of Sharon attracts hummingbirds, and butterflies, and also brings pollinators (bees) into your garden. Planted in the ground and well established it can be drought tolerant, but it will also take regular garden water. You can prune it into a tree form, create a multi-trunk shrub or as I mentioned use it as a hedge. 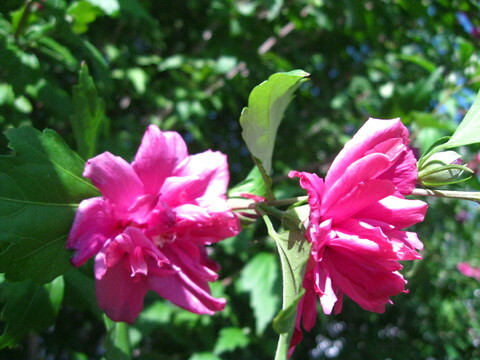 The Rose of Sharon is VERY versatile. They grow up to about 12’ tall and can get up to 6’ wide, so you should space them about 6’ apart and a bit closer (4’-5’) if you want a hedge. 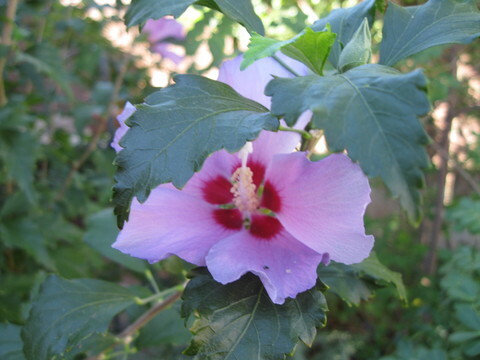 Your Rose of Sharon is pretty tolerant of different types of soil, but loves the addition of organic matter. A little compost can go a long way in adding nutrients to the soil, so make it a regular practice. You should prune as needed to maintain the shape and size that you desire, and in winter or early spring, prune off last season’s growth. This will help produce bigger blooms. In cooler winter areas a nice layer of mulch around the roots is great in the late fall. 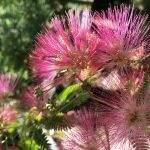 They can be invasive if you let the seed pods develop and you have them in a well-watered situation, the solution for that is easy! Just deadhead (trim off) the seedpods before they mature. If you are looking for an awesome selection of Hibiscus syriacus and you live in Southern California, look no further than Worldwide Exotics Nursery. They are in Lakeview Terrace, Ca. and have at least three varieties all grown in our harsh heat, so ready to go into your garden! Check out the website, they are open on Saturdays, and by appointment only the rest of the week. (So call before you drive over). Here’s a little bit of trivia that my mother told me: The Rose of Sharon is the National Flower of Korea, and it is called Mugunghwa. Save that one for your next cocktail party!